The Board of Supervisors met with the School Board on Saturday, March 8, for a work session on the budget. Supervisor and Chairman Scott York (At-Large) began the meeting by letting everyone know that no votes would be taken. Instead, votes would be at one of the next two work sessions: either Thursday, March 13 or Monday, March 17. Both work sessions start at 6pm at the Loudoun County Government Center. Supervisors Reid and York will not be present at the Thursday session, so the BoS may decide to wait to vote on motions until the following Monday. The decisions are not final until final budget adoption, which is expected to be April 2. That's important because there's still time to convince the BoS to listen to you. At the meeting Saturday, rescheduled from last Monday due to the snow, Supervisors Higgins (Catoctin) and Reid (Leesburg) and School Board members Rose (Algonkian), Bergel (Catoctin), and Sheridan (Sterling) could not attend. The School Board began with opening statements. One of the School Board members said that he hoped the Board of Supervisors would listen to the constituents who came out to the public hearings. York responded that while the School Board hopes we listen to the people, that there are people on both sides of the issue. He recounted an email he received from a single mother worried about her tax burden going up. He said that the BoS has to make sure they're doing right by all their constituents. Supervisor Shawn Williams (Broad Run) echoed that refrain. He said that he hears people saying to raise our taxes in the public hearings, but businesses won't move here if the BoS does that. Also, we need to remember people on fixed incomes. He didn't mention that there is a program for property tax relief for seniors and those on disability. Supervisor Eugene Delgaudio (Sterling) said that he plans to make a motion to fund the school budget at the same level as the current year, with no increase at all. The School Board has asked for $106.1 million increase. The equalized tax rate that the BoS set as their goal back in September would currently provide the schools with an approximate $66 million increase with federal and state revenue included. Delgaudio then cited the six or so speakers from the public hearings that spoke out against funding the proposed School Board budget by first name, saying that he appreciates their coming out. He didn't name the hundred or so that asked for the support of our schools. It may have been being generous that they were hearing anything at all. Please call and email your supervisors (both your district and Chairman York) and cc: loudounbudget@loudoun.gov. Ask a question and see if you get a response. Keep up the pressure until April 2. Ok, so this is going to go long. Feel free to stop anytime, but they also covered a lot of ground at the work session. Unfortunately, many of the questions that the supervisors asked were answered in the School Board's presentation to the Board of Supervisors on February 18. School Board chair Eric Hornberger (Ashburn) pointed out early in the meeting that the School Board's priorities, which the BoS had made a big deal about not receiving, were on page 5 of the presentation. They addressed all of these during the meeting. Nearly every supervisor questioned fixing the salary scale in one year. Supervisors Ralph Buona (Ashburn), Matt Letourneau (Dulles), Janet Clarke (Blue Ridge), and Williams all said that they supported competitive compensation, but went on to question the expense of $28 million for an average 3.9% salary increase for this year. Buona questioned why LCPS doesn't compare its salary to Clarke County. Hornberger said it was for various reasons: it is not listed in the WABE guide comparisons, it is not considered part of Northern Virginia, but most of all, Clarke County doesn't hire very much, so LCPS is not competing with them for its many hires. A quick check bears this out: Clarke County is currently looking for 1 assistant principal and no teachers. Loudoun County is currently looking for 1 assistant principal too, but also 5 principals and 10 teachers, and numerous other licensed personnel. Buona said that he had heard from at least one teacher who told him teachers had not received a raise in 5 years. But as you can see from the above chart that was only the step increase that wasn't received in 5 years. Still, in many cases, the increases in the past two years haven't even covered the extra cost from teachers' benefit cost increases. Fox pointed out that health care benefits at LCPS now match the county options. Buona then wondered why school employees use their health insurance more than county employees. Buona also suggested that teachers feel entitled to both a cost-of-living increase and their step increase on the salary scale and wondered where that entitlement came from. Perhaps its because even before they are hired, they are pointed to the salary scale stating what they can expect to make each year, prominently featured in recruiting, and they could reasonable expect it'd be adjusted for cost of living over time. The real reason to pay our teachers more is because they deserve it and we can afford it. What's your child's favorite subject in school? It likely had to do with a favorite teacher. And when they have a bad one, they lose interest. Teachers directly affect our children's education and future. Supervisors Buona and Williams both mentioned being able to fund renovations for Broad Run High School in this year's Capital Improvement Plan as a sign they support education. They used some creative financing, using $13.25 million cash surplus from the County and $1.4 million from the schools because they didn't want the debt service to increase too much. Wouldn't it be nice if teachers, who have a much larger effect on our children's education, could get the same kind of consideration? Supervisor Letourneau was the most forceful questioner on Saturday. He especially questioned the School Board on the amount of the budget request proposed to address growth. He found the number confusing as it is $10 million more than last year for a similar amount of growth. The School Board attempted to explain the difference. First, there is a new middle school, high school, and elementary school opening next year. Last year, there were only two elementary schools, which required less staffing. In addition, some of the cuts from the past two years were being addressed. 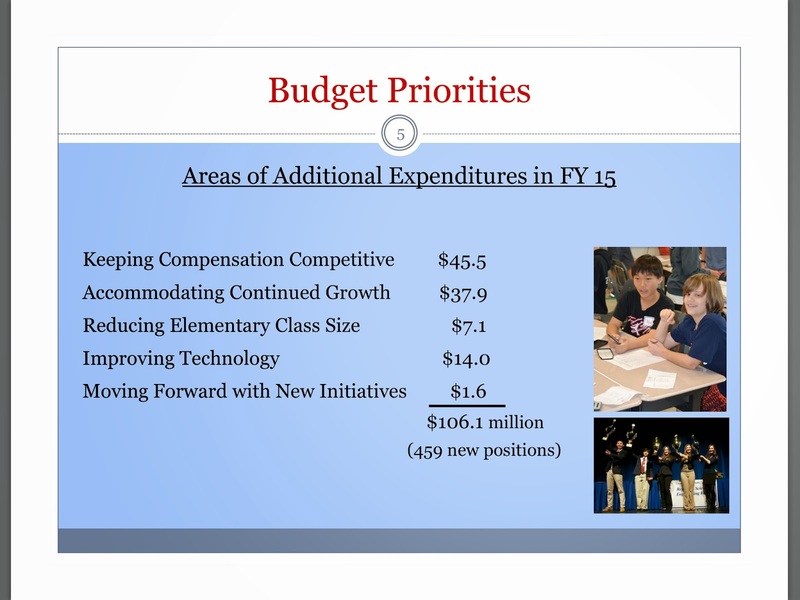 For example, while enrollment grew 3.8% last year, the School Board's budget only increased 2.5%. LCPS does a zero-based budget each year, going through staffing for the projected students school by school and class by class. Finally, LCPS is handling more ELL and special education needs each year. Hornberger said that at two representative high schools, Potomac Falls and Heritage, 25% of staffing goes to special education and ELL. This year, School Board vice-chair Jill Turgeon (Blue Ridge) said, 59.6% of LCPS employees are teachers. Next year, the proposed School Board budget has 59.8% teachers. Letourneau argued loudly with the School Board members as they defended the numbers, but they promised to get his questions answered in detail. Many supervisors agreed that improving bandwidth at the schools was a crucial new expense. Supervisor Suzanne Volpe (Algonkian) wondered why the School Board proposed a technology reimbursement program for teachers as a Bring-Your-Own-Device pilot, though, when LCPS could bulk purchase devices for every teacher at a reduced cost. This is exactly what LCPS staff has proposed for the past two years. However, the School Board changed to the reimbursement plan both to save in costs, partly because it doesn't cover all teachers, and to test out the BYOD theory, which they may decide to use for students as well. Clarke suggested that perhaps the teacher tech reimbursement should wait until after the bandwidth is expanded. Volpe passed on a question from a former FLES teacher asking why the School Board is considering starting a Spanish Immersion program so soon after reducing FLES. Fox and Turgeon explained that it is a very different program, and one that should have a much greater positive effect on language learning. Clarke wanted clarification on the expansion of full-day kindergarten. She said she's heard from a lot of parents happy about its expansion. Turgeon said FDK would be expanded from 4 schools to 9 schools out of 56 total in the proposed budget. However, other parents could request to attend one of those schools if there's capacity. Volpe suggested limiting full-day kindergarten at the 9 schools to only at-risk students. School Board member Kevin Kuesters (Broad Run) said that he does not support full-day kindergarten as a rule except for at-risk students. He plans to look at modifying the school choice policy so that extra capacity in FDK programs will first go to at-risk students. Wow, if you made it this far, thanks for your interest. The last topic that was addressed was possible cuts. Now that the BoS understood that these are the School Board's priorities, what would they cut if they don't get their full budget request? Chairman Hornberger pointed out that the process of reconciliation will determine that for the School Board. They will meet after they find out their funding and vote on any necessary cuts after first hearing from LCPS staff and the public. That's the standard process. However, individual School Board members could say where they think they would cut. Hornberger mentioned closing small schools, further cuts to FLES, and eliminating the expansion of full-day kindergarten. He felt that LCPS could absorb a $10 million cut from the proposed School Board budget without too much distress, but after that, they would be cutting into items the community as a whole definitely values like transportation and sports. Turgeon said that about $50 million of the proposed budget request are required expenses like retirement funding, increased healthcare costs, and addressing growth, leaving only around $15 million for new initiatives if the BoS only approves the current suggested amount at the equalized rate. She felt that new initiatives would be cut severely if that happened. Again, if you support this budget, you need to let the supervisors know. Contact your supervisors now. Once the BoS takes their initial votes on the schools budget, you can address them in person at the public input at 6pm at the Wednesday, March 19 regular business meeting at the Loudoun County Government Center. Call (703) 777-0200 to sign up to speak.